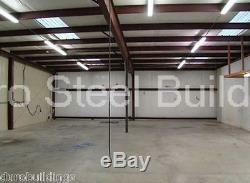 I-Beam Building 30' Wide by 30' Long by 16' Tall Straight Wall Style. Clear Span Loads can be adjusted for local codes call : 1.800.445.0412 / International #: 001.954.927.6566. 35 Year Galvalume Coating (under normal weather conditions). Solid I-Beam Construction 100% Solid Red Iron Full Frame on Door Openings 26 Ga. 80,000 PSI Sheeting Welded Clips Steel Base Angle Color-Coated Fasteners Construction Drawings. Take the Time to REALLY Compare Us! We don't just sell buildings, we engineer, design and detail your building. Our in house Engineers are available at all times to make sure you get just the building you wanted. Additional Cost Or Not Available. We are all humans and errors can come up, however our expert technicians and customer service specialist are available at all times to make things right. All components including sheeting, I-beams, accessories and even doors are manufactured in house. Our Pre-Cut, Pre-Punched and Pre-Drilled Parts allow quick and easy assembly. No drilling or welding required. Our Long Life Hex Flange Bolts, Hex Nuts, Washers, Screws & Fasteners with Matching Finish ensure tightness and weather protection for the entire building. All Duro Steel Buildings come with cable bracing which will add strength and rigidity. All Framed Openings come with Jamb & Header cover trim giving your building a more attractive finish. Duro Steel Buildings are 100% made in the USA from the highest quality, heaviest gauge US Commercial steel. All our buildings are constructed with 100% solid red iron and GALVALUME steel; a special aluminum-zinc alloy developed to provide extreme durability. The GALVALUME steel protects against the harshest weather conditions and is highly corrosion-resistant. The demand for environmentally-friendly construction products and practices, or green buildings, has accelerated in recent years. 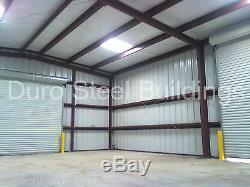 Duro Steel Buildings is well aware of this demand and offers the highest quality 100% recyclable steel buildings. Duro Steel Buildings is committed to excellence. That's why its backed up by some of the highest standards, such as. American Institute of Steel Construction. Canadian Institute of Steel Construction. Professional Engineers Licensed in 50 States and Canada. Optimal Construction A Duro Steel Building can optimize your building time and reduce your total construction time by weeks and in cases several months. Personalized Design Each Duro Steel building can be accommodated to suit your needs. It can even be designed to allow expansion, while maintaining its uncompromised clear span interior. Potency and Resilience Steel buildings are more likely to withstand severe weather conditions than other types of construction, as well as overcoming other issues such as pests. Duro Buildings uses the highest quality metal and components. You can be sure that your investment will be built to last and will serve you for many years to come. Virtually Maintenance Free The long life finish on our Galvalume steel provides years of care-free efficiency. 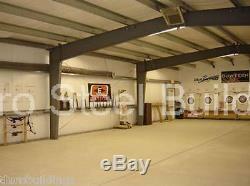 Energy Efficiency Duro Steel Buildings Galvalume finish allows heat to bounce off the building. When complemented with insulation, these buildings will be between 10 to 15 degrees cooler in the summer and 10 to 15 degrees warmer in the winter. Many of Duro Steels colored panels meet the reflectivity and emissivity performance levels required by LEED and ENERGY STAR to mitigate the cause of urban heat islands and energy consumption overall. Green Buildings Duro Steel Buildings are created with 100% Recyclable Steel. Cost Efficiency Labor cooperative buildings, lifelong durability, virtually no maintenance and more affordable prices than almost any other type of construction, its simple to see why Duro Beam Steel buildings should be your #1 choice for prefabricated construction. Here at Duro Steel Buildings we strive for excellence and hence our products are always up to date with the latest certifications and requirements. State of Florida Product Approval for All Structural Components Including Wall Panels, Roofing, Doors, Windows & All Accessories. Las Vegas, NV Clark County Approval. City Of Houston, TX Approval. City Of Los Angeles, CA Approval. City Of Phoenix, AZ Approval. Our Customer Service is Second to None! The item "DuroBEAM Steel 30x30x16 Metal Building Shed Auto Lift Workshop Garage Kit DiRECT" is in sale since Saturday, January 19, 2019. This item is in the category "Business & Industrial\Building Materials & Supplies\Modular & Pre-Fabricated Buildings". The seller is "durobuildings" and is located in Kansas City, Missouri.